3.25" Bird and Birdhouse Hand Painted Ceramic salt & pepper shakers. Features a magnetic insert to hold the two shakers together. 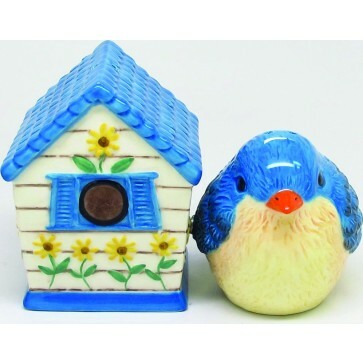 Expand your wings, learn new things and fly as high as you can with the Bird and Birdhouse Hand Painted Ceramic salt & pepper shakers. They are 3.25" high and have a magnetic feature to hold the two shakers together.